Am I Invited to the Cookout? Home / Blog / Featured / Lifestyle / Am I Invited to the Cookout? Being black and vegetarian can be something that inadvertently shuts you out of the black community. It doesn’t make you any less black, but it can make you feel a little less invited to the ‘Soul Food Sunday’ cookouts. When I decided to become a vegetarian, I was given strange looks from all of my family members. It was a complete change from the girl they knew who was an avid meat lover, and they questioned what led me to my decision to completely give up meat, seafood and (some) dairy, to which I simply told them that I had grown sick of it and the way it made me feel. At the time, that answer had sufficed, but then I realized that I should probably dig deeper into my reasoning. According to the US Department of Agriculture, the average male takes in more protein fiber than females. A woman my age would need to take in 70 grams of protein. You need a lot of energy in order for you to digest meat, and for someone like me, it made me more nauseous as I continued to grow in age, and the fact that the meat was processed did not help in my case. Meat and other animal produce are not something that we need in our diets to survive, but it is something that has predominated our society for generations, especially in America. 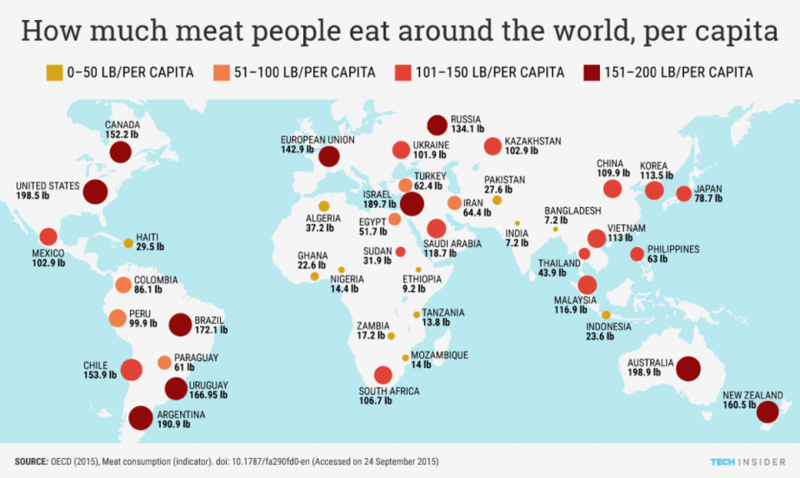 The Organization for Economic Co-operation and Development (OECD) reported that America is the second country with the largest meat consumption, just barely behind Australia. The black community in America contributes a lot to this number, according to another data study from the US Department of Agriculture. 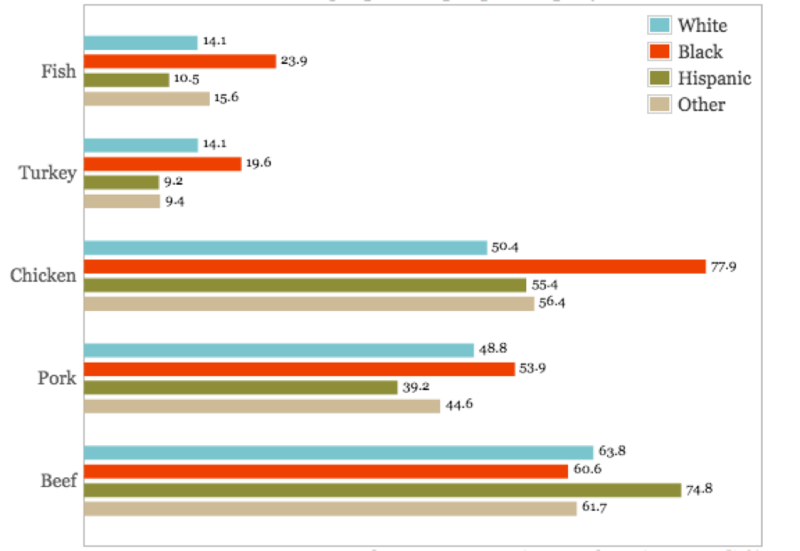 Aside from beef, we dominate the charts as the people with the most meat and seafood intake. This also makes us more prone to the colon cancer gene. As much as people love those foods that are on the top of our diet pyramid, they are also high in fat, cholesterol, and sodium. 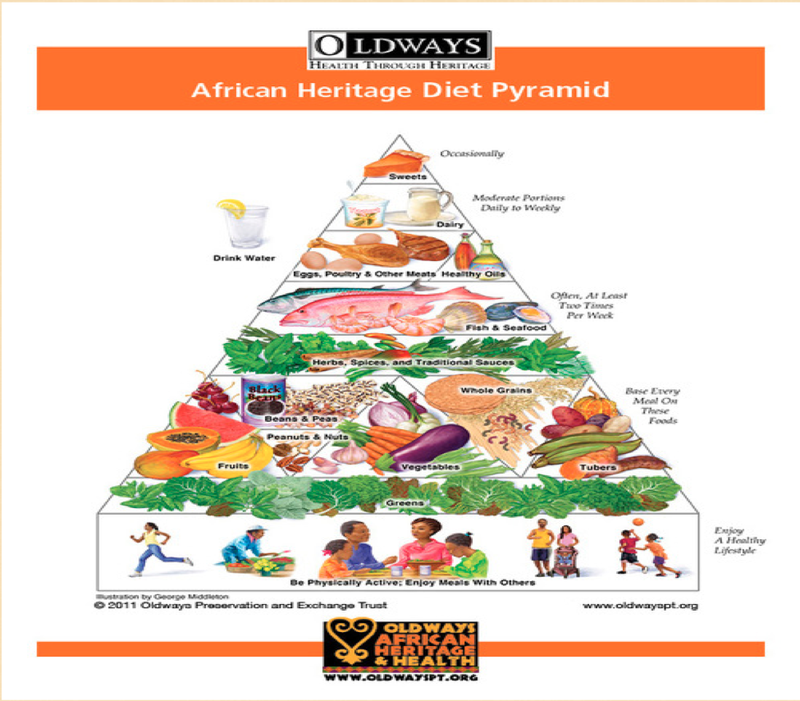 For centuries, our ancestors have lived off of meat produce and whatever else they had to work with during the times of slavery. People today take pride in eating this food in good company and forming a positive connection through it. I was a part of that environment and I do not regret that time, but I am also proud of the lifestyle I live today and not contributing in the cruel and unnecessary gruesome treatment of the animals. I’m sure that my fellow black vegetarians know what I mean when I say that in certain aspects, you can miss eating meat because you never had to worry about fending for yourself during a meal at Grandma’s house, or just having a nice conversation with your carnivore family without the snide comments about you being a vegetarian. But, it is important that we don’t let this take away from our blackness and that despite the differences we may share with our carnivore family and friends, we maintain some kind of bond that never makes us forget where we came from.